Training for the women's Alpine skiing downhill was scrapped on Tuesday to protect the piste while mild conditions meant a mushy track for the Nordic Combined event. "It's not even slushy, it's just mushy," said Bill Demong of the United States, who won the gold medal in the Nordic Combined large hill event in 2010. "There is no structure to the snow at all. It's very hard to ski on, it's almost impossible to ski easy." Image: Sho Endo of Japan in action during a training session. Temperatures are expected to rise to at least 15 degrees Celsius later this week in the Black Sea resort, which is hosting Russia's first winter Games. The mountain venues, about an hour away, could see daytime temperatures of around 10 degrees towards the end of the week. This is not the first time Winter Games organisers have had to deal with the impact of mild weather on courses. 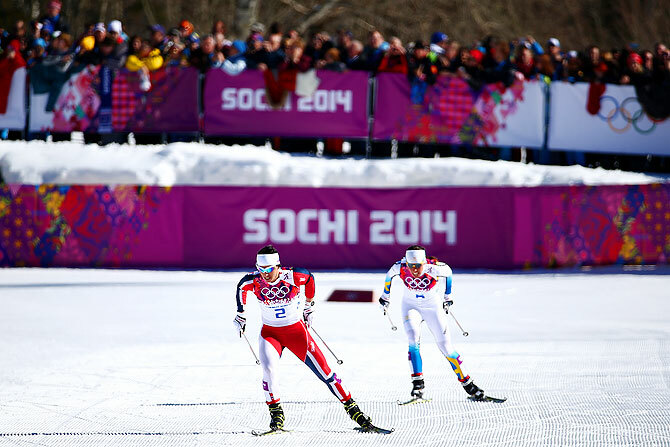 Image: Marit Bjoergen of Norway approaches the finish line ahead of Charlotte Kalla of Sweden to win gold in the Ladies' Skiathlon. At the Vancouver Games four years ago, snow was brought in by helicopter as higher than average temperatures wreaked havoc with the competitions. 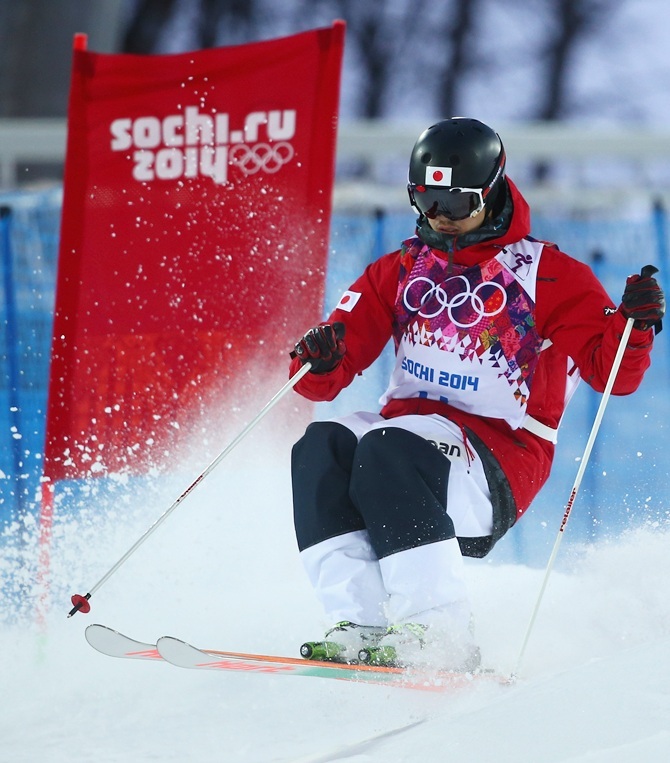 "The conditions have changed," said American skier Bode Miller. "Now it is a completely different race course. It is going to be tough, because of all the good slalom skiers out there. "The downhill could have done some real separation if the course remained hard and icy. It could have been a real challenge for the slalom guys. It could have made a pretty big gap on the downhill side. "It could have been a great race but now the conditions are much easier and it will be much more difficult to put some time on." 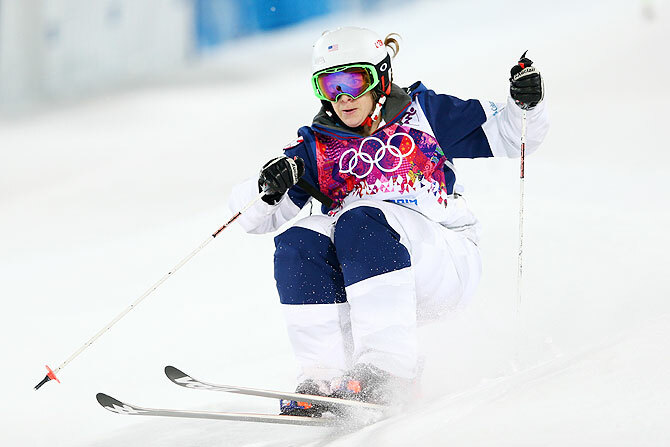 Image: Hannah Kearney of the United States competes in the Ladies' Moguls Final. Organisers in Russia also had to battle melting snow at last year's Olympic test events. Snow from last winter had been stored higher up in the mountains and some of it had already been used, at least for training sessions, officials confirmed. "With the Olympic Winter Games the weather always has an impact," Sochi Olympics spokeswoman Alexandra Kosterina told reporters. "If we talk about mountain cluster, there is no way it cannot. "If you have seen Olympics in the past, all of the organisers always had delays, always had to adjust the track depending on weather conditions. "There were adjustments with the halfpipe, there were adjustments with the jumping centre," she said. When Sochi bid for the Games back in 2007 the city's subtropical climate coupled with the snow-capped Krasnaya Polyana mountain tops were pitched as an attractive asset. 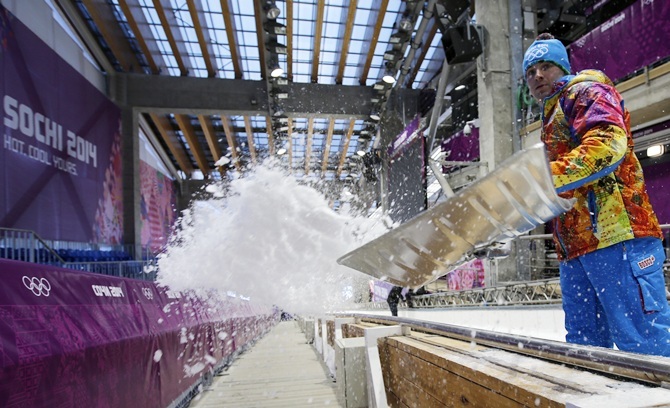 Image: A volunteer shovels ice from the track at the start of the bobsleigh ice track.